We have been told by crew members that the entire second season will air straight through without any breaks. 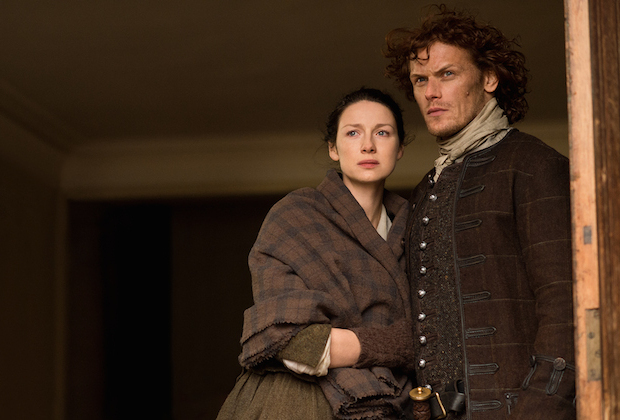 However, there will be a one week break on July 2, 2016 as Starz airs a season two marathon. Episode 213, the season finale aka “Dragonfly in Amber,” will air on the following Saturday, July 9, 2016 and it will be a 90 minutes long. This will also affect international scheduling of the season finale. Thanks to Karen Henry from Outlandish Observations for figuring this all out! Update (6/7/2016): Starz finally made an official announcement about this and tries to make a big deal about Roger and Brianna being in this episode. If you read any interviews after 201 aired, Ronald D. Moore and company spilled the beans on that one and admitted that the bookends of the novel will be switched in the television series. We also see Claire (Caitriona Balfe) and Jamie (Sam Heughan) in the first photo released from this episode. Below is a very spoilery synopsis of 213, “Dragonfly in Amber,” that I would suggest that non-book readers skip. This entry was posted in Caitriona Balfe, Production Photos, Sam Heughan, TV Show News and tagged Caitriona Balfe, Dragonfly in Amber, Official Photos, Sam Heughan, Season Two by Sarah Ksiazek. Bookmark the permalink.